A view of the Phoenix-Mesa Gateway Terminal, ramp-side at the October 2003 open house. Phoenix-Mesa Gateway Airport is located 20 miles Southeast of Phoenix in Mesa, AZ. From PHX drive East on Loop 202 to Loop 101 South. At the southern end of Loop 101 rejoin Loop 202 Eastbound to Power Road. Go South on Power Road to the airport (follow signs). Or, take I-10 Eastbound from PHX to Loop 202 Eastbound. Exit at Power Road and go South to the airport (follow signs). Phoenix-Mesa Gateway Airport is located on the site of what was Williams Air Force Base. Several aviation related businesses and some light aircraft are based here. Manufacturers such as Boeing, Cessna, Embraer, and Hawker-Beechcraft have maintenance facilities here. 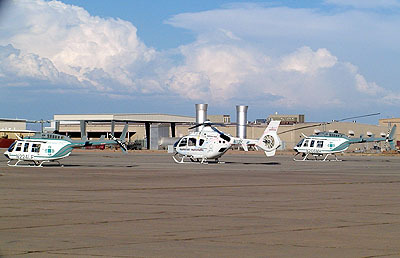 Native American Air Ambulance has its base here and the Eastern campus of Arizona State University is located here as well as numerous other businesses. The airfield is used for flight testing and pilot training by several aircraft manufacturers and airlines. Some cargo is shipped through Gateway by various cargo airlines, and the airfield is used by general aviation as well. Allegiant Air and Spirit Airlines have scheduled flights to several destinations out of the passenger terminal at Gateway.